A non-matching pair of fancy-color diamond earrings named after the twin deities Apollo and Artemis set an auction record at Sotheby’s Geneva yesterday when they sold for a combined $57.4 million. 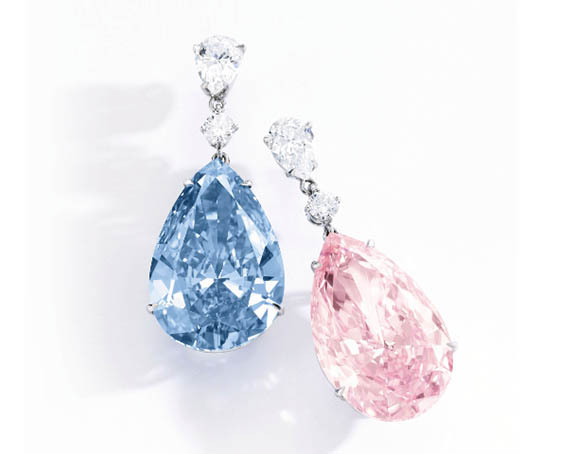 The pink and blue pear-shaped duo now hold the title of the most valuable pair of earrings ever sold at auction. Sotheby’s had promoted the earrings as a pair, but offered them as separate lots. Any fears that the Apollo Blue and Artemis Pink would be separated forever were put to rest when a single anonymous buyer claimed both siblings. “I am delighted that the stones will remain together as earrings,” noted David Bennett, Worldwide Chairman of Sotheby’s International Jewelry Division. The Apollo Blue had the distinction of being the largest internally flawless fancy vivid blue diamond ever to be offered at auction. Sotheby’s had set a pre-sale estimated price range of $38.3 million to $50.4 million. The hammer price, including the buyer’s premium, was $42.1 million. Just last year, the 14.62-carat “Oppenheimer Blue” set a record when it yielded $57.5 million at Christie’s Geneva. In addition to the record-setting earrings, Sotheby’s collected a record price for a fancy intense purplish pink diamond at $13.2 million. That same stone also established a record per-carat price at $1.9 million. Credit: Image courtesy of Sotheby’s. Screen capture via sothebys.com.